So I hadn't read any actual Sci-Fi in awhile and was looking for something fresh and good. 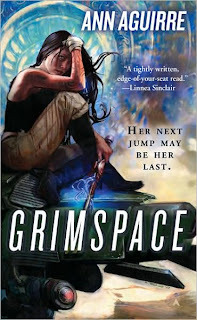 I read a blurb Sharon Shinn wrote for Ann Aguirre's Grimspace and eagerly picked it up the day it came out. Space opera meets urban fantasy, Grimspace is, justifiably, being compared to the most excellent Firefly and Serenity. In other words, it completely rocks. Sirantha Jax, known simply as Jax, is a rare J-gene carrier, which means she is able to "jump" into a parallel kind of hyperspace known as grimspace and serve as navigator for ships traveling across copious distances in a short time. Each jumper has a pilot and the bond between them is incredibly complex and intense, to put it mildly. Only problem is Jax's pilot is dead, killed in their last flight along with everyone else on board except Jax. Now she's locked up in solitary confinement, deep in the bowels of The Corporation. Under intense psychological "therapy," Jax is forced to relive the moments leading up to the crash over and over again until she either goes mad or confesses to having sabotaged the trip. Enter March--a renegade pilot who offers Jax a way out. Come with him and his crew and help train a new fleet of jumpers intended to undermine the Corp's stranglehold on travel through their world. Or die for a crime she didn't commit. Jax chooses life, but is determined to have it on her terms. The irascible March desperately needs her abilities but trusts her about as far as he can throw her. Unsurprisingly, all does not run smoothly for March and his crew once they have Jax aboard calling shots, sticking her oar in. Their fast-paced adventures take them to various corners of the galaxy where they encounter a host of strange characters, including one awesome, alien bounty hunter called Velith. The story is written in first person, present tense, which apparently bugs some readers but which I thought fit the plot and character perfectly. The pages fly by at record speed and it's all so urgent and large and satisfying. Like one of Sunshine's Cinnamon Rolls as Big as Your Head. But, in the end, Jax is the first and best reason to read this book. Full of anger, pain, suspicion, and ego, she's a great big ball of fiery fun. I loved spending time in her world and am very anxious to read the sequel, Wanderlust, due out in September. ". . . and it's all so urgent and large and satisfying. . ."
Thanks. I loved how it went out with a bang. Wow, thanks for this fantastic review. I still get choked up at the ending -- how she goes to him bald and barefoot through the snow. I don't know if you've seen Natalie Portman in V is for Vendetta, but her head-shaved look is how I envision Jax in that scene: sort of lean and vulnerable, but also possessing an indomitable will. You are most welcome. Thanks for writing a book it's such a pleasure to read and review. And I was seriously thinking of V for Vendetta when I read the entire end of the book. That scene where she sees what she's done to March and then walks into the room...still gives me shivers. Just an incredible book. It's hard for me to find a good sci-fi book. This book starts out great. Leaving you wondering what happened. The story moves well. It follows a broken woman's journey to fix herself and find the truth. This book has a very Firefly feeling to it. A group of outlaws struggling against a Corporation with vast wealth and power. The author also hints at Jax's unique ancestry. Giving you a little bit of information but leaving you wanting to know more.